Twin Cams from 1999 through 2006 (expect for the 2006 Dyna) – Harley Davidson’s cam chain tensioners on their Twin Cam motors were, to say the least, a complete and utter failure. A lot of us were, and are still, scratching our heads wondering how in the world they could not be held accountable and forced to recall these motors to be repaired on their dime. Harley, eventually offered us an expensive “upgrade” but it was really just a repair/correction of their bad design. Although some motors are ok up to 40k or 50k. It has been our experience that most cam chain tensioners need replacement between 20k and 30k. We have seen a large number of bad cam chain tensioners under 15k. Debris from these failing tensioners can cause premature failure of the oil pump and cam bearings leading to more catastrophic engine failure. 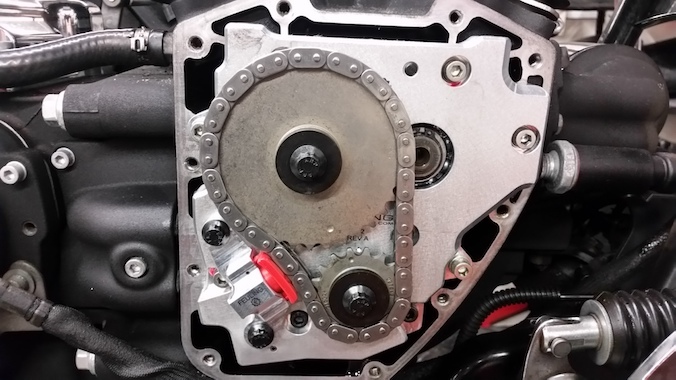 Being that a failing tensioner cannot always be heard, we have to suggest to our customers & friends that any 2000 to 2006 Harley Davidson with spring style tensioners and 15k miles or more, have a visual inspection of the cam compartment. This is the only way to positively identify if you have good or bad tensioners. If you inspect your tensioners at 20k miles and they appear to have very little wear, it may be safe to run another 20k before another inspection. If tensioners are worn to 50% or less, we recommend upgrading to a hydraulic cam chain tensioner assembly or direct gear drive. Although it is a cheaper option, we do not recommend replacing with a new set of spring style tensioners as it is a gamble on how far they will take you. When inside your cam compartment, it is of upmost importance that your inner cam bearings and your cam plate bearings be replaced. Also, thoroughly clean and inspect your oil pump and lifters if they are to be reused. There are a number of options available for hydraulic or gear drive assemblies. Cost will vary significantly. Do some research to determine what assembly or combination of parts will work best for you, for your riding style and for your budget. Here is an example of a bike that recently passed through our shop. Been there, done that. Can’t emphasize enough the importance of changing out the tensioners, cam plate, oil pump, cam chain, cam bearings, ASAP !!! Old?….Wow…..The MoCo was really thinkin’….. Can’t wait for the M8’s….. I have a 2002 springer FLSTS. I have 50000 miles never been checked.. Where do I go from here and what will the cost be. Do HD bikes prior to 2000 have a more reliable cam chain tensioner system? Yeah, before 2000 they had single cam motors. No tensioner to fail in an Evo. I have a 2005 Heritage Soft tail with about 32k miles on it. I inspected the cam chain tensioners last year and it had very little wear. I heard nightmare stories about the original spring tensioners failing and went ahead and put the Screaming Eagle upgrade kit in. It includes the bearings, hydraulic tensioners, bearings, and a new heavy duty oil pump. Now my mind is at ease. got wind of the problem after buying a 2002 Road King second hand so instead of going thru all the bru ha ha I change it out at 40 thousand miles to gear driven system no more problem the bike runs great ! I have an 05 RK. What is the cost of the gear driven cam system you installed? I have a 2000 FLHTC-I. 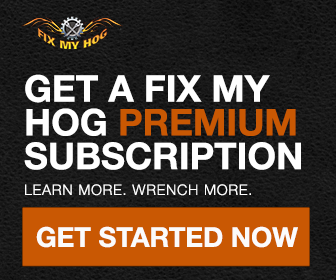 I replaced mine at 44,210 miles with the Screaming Eagle Hybrid Cam Plate and High Flow Oil Pump Kit, Part Number 25284-08 and I switched from using Syn3 oil to AMSOIL. The original tensioners were totally shot. I have a 2005 HD Electraglide and now have 30,000 miles on it after I bought it used with 3,000 miles. I’ve read all the “scare stuff” on the computer since buying it re: chain cam tensioners. I took it apart and to my surprise after reading all the “scare stuff”, the stock tensioners were barely scored. After talking to my step son, who has a carburetor repair business, he claims that most of the stuff on the internet is indeed “scare stuff”, like the people for years who have been bad mouthing Holley carbs. I think that the problem is that riders whack on the throttle at stop signs, as did the failing dirt bike tensioners in the 70’s. I’ll just replace the shoes, as the shoes will outlast me (I’m 84 and don’t whack the throttle. I love the things you guys point out. It’s sooo helped keeping my bike’s running at top form. Thanks !!! Yeah, actually starts with some 1999 models. I picked up a 99 FXDL with 17K and the tensioners are about 25% worn. Inside shoe a little more. I’ll be checking every winter until it’s time to see about Gear drive. First I would mention that every engine manufacturer has used the same type of technology that Harley used here. The main problem with this is a Harley is that your bikes sit more often than not which leads to a dry start each time you do end up riding. The sprung tensioners were utilized from 1999 when the Twin cam was introduced until 2005/2006 when they changed the cam tensioners from sprung to hydraulic. You can purchase a hydraulic unit from Harley for around $500 or you can pay three times as much for the fueling unit they are pushing here. With a stock crank the gear drive cams shouldn’t even be a mentioned as the run out can be more than gears will tolerate. I have a 2002 Electraglide Std. and although I do some basic maintenance I don’t have all the tools or the experience to do the work I ended up having to do. I was not aware of the crap tensioner system Harley put into the motors for 2000 to 2006. So when my oil light came on I immediately shut the engine and got the bike back home and in the garage. I did a quick check for oil pressure (hoping the sending unit was bad), but found no pressure at all. I shut the engine down and called a friend who has a lot of HD knowledge and he informed me to the problem. We looked and sure enough you could see that the little plastic part had started to break down sending particles into the pump. I brought the bike to a reliable mechanic and he went through the entire engine and all the components. The oil pump was no longer working but he found no other issues. so he replaced the spring tentioners with hydraulic ones (good for 100k), replaced the oil pump and because the engine was already apart I chose to add new cams to boost my power a little. All said and done, lesson learned, I now will seek out all the info I can so I won’t be surprised again by something like this. I will say I do think HD did a disservice using parts like this and should have offered owners a fix or $ for what it took to get them fixed. I understand there is always some kind of upkeep but when parts that are likely to fail and can cause even more damage, HD should step up and resolve this at their cost. HD has made a lot of $ and if they continue ignoring things like this they may not continue to do as well. 100,000 miles; maybe not. I have a 2007 Wide glide, stage 3. Although I enjoy occasionally gently rolling the throttle open engines of all forms have been my life, I treat them that way. I use Red Line synthetic oils in all cavities. Now at almost 60,000 miles on my bike I am on my third set of cam tensioners. Although I have never had a failure or anything near it @ 29.000 miles the pads are starting to groove. That’s far enough as the wear accelerates exponentially from there. Honda, Yamaha et-al polish the outside of their cam chains and so they do get 100,000 + miles of service. HD does not seem to do this. Might be a good idea to have a look at the hydraulic pads at least every 30,000 unless you are frequently in the throttle. Pay to play. I have a 2011 Super Glide with the 96 Twin Cam. But it only has 8000 miles on it at present. I’ll probably opt for the gear system one day. Yes changed mine out at 25,000 . They had no wear. But better SAFE then sorry. Mine is 2005 Heritage Softail. So ..If it’s the shoe wear that’s the issue here why does a hydraulic fix that uses the same shoe just without the spring make a difference and why not just replace with the cheaper spring loaded shoe until the gear drive can be afforded. Seems like the hydraulic is just a waste of money. But if they ( HD ) switched to the Hydraulic part and fixxed the problem , there’s something I don’t understand I guess. Unfortunately, Gear driven cams aren’t a solution for everyone. The crank runout has to be within spec. Anything over 0.003″ (set by the cam manufacturer) runout and the manufacturer of the cam will tell you that you can’t use Gear driven cams. I changed my Tensioners (hydraulic) at 47,000mi (2015 FLHXS) as they were starting to wear a little too much (just cause they’re Hydraulic doesn’t mean they won’t fail, but it is much better). When I measured the crank runout, I was at 0.005″ so I had no choice but to do another set of chain driven cams. Rumours are that no a lot of bikes come of the factory floor with 0.003″ or less runout, but the MOCO doesn’t care, more $$$ for them. I think the top end of the spec is somewhere around 0.012, if I remember right. Excess runout for Gear driven cams will increase the noise (there already will be an increase in noise when you change to Geared cams) and may lead to damaged gears. I replaced my cam plate with the S&S version because it comes with a screen and magnet for the oil pump which can delay the damage to your engine should there be a tensioner failure. The S&S tensioners are also designed to allow additional oil flow and are made of a more durable plastic. Don’t mean to sound like an idiot, but what is the crank runout, and how do you measure that? I have an ’06 E-Glide with about 20,000 miles on it, and am thinking of driving it from NY to CA this summer. I wanted to do the gear upgrade but don’t want to spend the $$$ on an upgrade that possibly won’t work for me. I need to know how to measure this runout so I can check it, and then decide on the gear upgrade,(1st choice), or the hydraulic tensioner,(2nd choice). You were saying that anything more than 0.003″ runout and you can’t use the gear upgrade, but then you say “the top end of the spec is 0.012″ So are you saying the runout can be as much as 0.012″ and still use the gear drive, or are you saying the high end of the spec is 0.012″ as it comes from the factory and many bikes are produced with a crank runout that’s not within spec, 0.003”, to allow the gear drive upgrade? I replaced the Harley cam tensioners with S&S gear drive on my 2006 roadking years ago. I have 96,000 miles on the odometer. I have never had a cam related issue. yes the initial cost is high as the cam plate, cams and gears set must be purchased but once it is installed you can forget about cam issues and related failures. You also pick up some “free” horsepower through related friction reduction. I have a 2000 FLHTC with 50,000 miles. After hearing of the can bearing issue and then the follow on can chain tensioner with 5,000 miles I changed over to the S&S gear drive and have never had a problem since. It cost about $1500 but I would encourage everyone with a 2000 – 2006 HD to go with the gear drive and be done with the problem once and all. my 05 softail has an ss stage 2 kit . Question would the cam chain spring tensionsioner have been replaced with this kit bike has 6000 miles on it. 70,000 miles on my ’04. No problem with them yet. What is the lifespan on later twin cams? I have a 2010 Limited with just under 35,000. Wondering because sometimes a little hard to start and will backfire when too much fuel builds up. Just did the screamin eagle upgrade w/inner cam bearings for just under $900.00 on my 05 Electraglide. Spring Tensioners were at about 50% 23000 miles. I bought a 1999 Road King twin cam in 1999 … at about 25,000 miles on a 4000 mile road trip it all came apart … ate the cam bearings and the oil pump. Had to load it up 1000 miles from home and take it back in a U-Haul. When I got home I installed a gear drive cam new oil pump and complete engine rebuilding it to a 95 C.I. motor … lower end included due to all the metal that went into the crankcase. That was 40,000 miles ago … still running stronger than when it was new … Harley didn’t pay a dime … and I never received the recall notice … although the shop said it was under a recall … but since I had never taken it into have the recall done they were in no way obligated to repair it … ??? I did this repair myself some time back on a 2003 road king. What I’ve come to understand is that direct drive for the cams can’t be used due to the crankshaft being so sloppy. It can run as much as 30 thousandth out of true at high rpm. I’ve been told the crank would have to be tried and welded to eliminate chain drive cams. Yeah thanks to these guy’s and other forums,did a big jump from fl shovel to a 07 glide and very happy,161ks zero issues!! ..refesh soon,but still really ok.103 logical step too. but came across ,earlier models at good prices at times,here in oz..stralia!worth the fix if can! Why not a gear conversion? I’ve been told when you change to a gear operated cam, that it takes away some of the horse power. Is it that significant of a loss? If not, why doesn’t HD just change over to the gear operated cams? I owned Honda for about 40 years and I fell in love with the Rocker. It was this problem that prevented me from getting one. I was told cost to cure (change to gear driven) would be about $1,000. My son bought a new XL1200 and told me to ride it. Now I have one too. Yeah, its just a 1200 custom but I absolutely love it and I don’t have to worry about that cam problem. The main reason I love HD is the simplicity and to have these type of problems is something I don’t like. Eventually, I will go bigger but for now am happy with what I have. 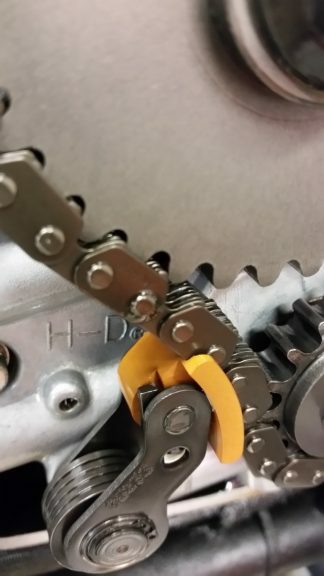 I know there’s a reason to use a cam chain tensioner, but maybe they could make “gear driven” an option in the future. Like I say, I’m new to HD so I don’t know all the info an “old salt” would have but I do love my machine. Make it an option for new bike buyers. hydraulic kit along with new bearings. Expensive “owner fix” for a factory created problem. I have 2006 Electra Glide went to gear driven S &S 510 cams at 24,000 miles ain’t looked back got 49,000 went to sturgis and back to N C last year with no problems! Does the twin cam in the 103 have the same design flaw? I have a 2004 Dyna Wide Glide when changing oil I found metal on magnetic plug. I also found metal in the oil filter not as much .??? ?